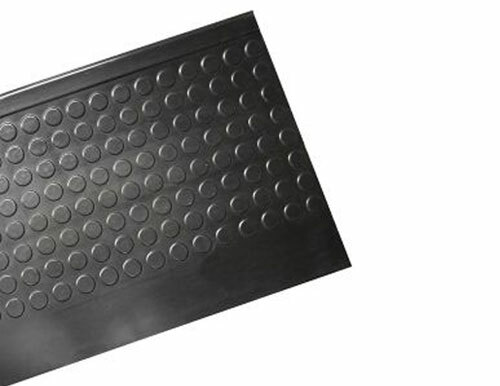 These anti-slip stair treads are solid black and feature a modern disc-patterned design. Sure-Foot is a safety leader, manufacturing rubber stair coverings that can help you ensure safe pedestrian foot traffic. Our designs are made with top quality compound, making them easy to clean and durable. You can be sure these anti-slip flooring solutions are long-lasting and easy to maintain. Rubber and vinyl stair treads are perfect for interior stairs in any building where you need safe footing. Most commonly installed in hospitals, schools, and commercial buildings, our products are an economical and attractive anti-slip solution.